My sibei kiang friend from Harvard, doing his Masters, came back to Singapore and he wanted to eat Indian food. So we always go back to Lagnna, which offers 10 levels of spiciness. If you can eat level 8 and above, then the food is free. As you can see, this place is sibei popular with angmohs. One of the reasons is the ambience, I think, it’s a barefoot restaurant; you have to leave your shoes at the entrance of the stairs, and walk up to the second floor (so don’t wear your expensive shoes, wait kanna stolen). But anyway hor, I don’t think it’s the real Singapore. 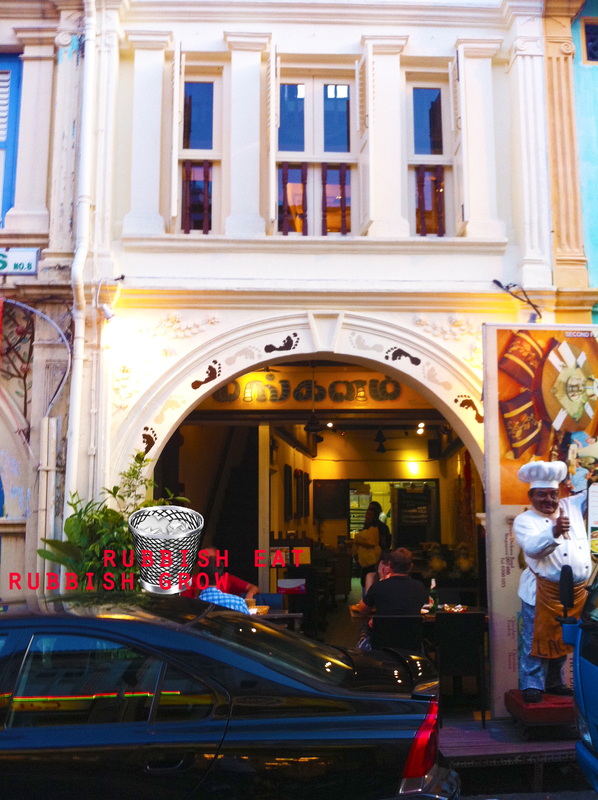 If you’ve balls, just walk deeper into Little India, go into any of the stalls. The servers can’t even speak England, so you’ve to point the dish. It’s veri exciting and cheap. Here, the hostess speaks very good England and is veri friendly, like she’s my ho peng you when I only just met her. I think that’s why the angmohs like. My kiang fren ordered mango fish, palik paneer and daal. He had naan, I had rice. The mango fish was delicious, spicy, tender, with just a tinge of sweetness from mango. But I cannot appreciate the daal and palik paneer. 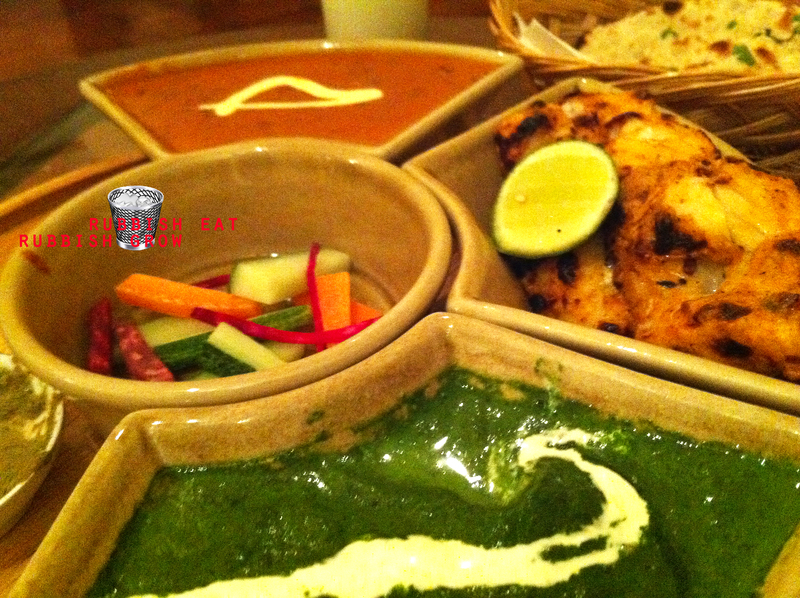 The daal was like water-down curry and the palik paneer was bland, tasting like spinach puree. I know it’s suppose to be spinach, but the taste was raw, like spinach juice. Dunno leh, my tastebud not as sophisticated as my worldly fren. My fren said he likes the palik paneer because it wasn’t stewed so long and still retained the greenness of the veg. I still like the Bar Bar Black Sheep one. But the rice here was amazing! Every grain was separated and it had a milky texture – coconut milk maybe? If friends want to hang out here, I don’t mind. But I find this gimmicky– they make cheap decor, saving on chairs, into a good thing–and I find the hostess a bit sleek. I’m an in-built mechanism against instantly-friendly people but I know it’s my problem, not the management’s. SPGs, this is your place! 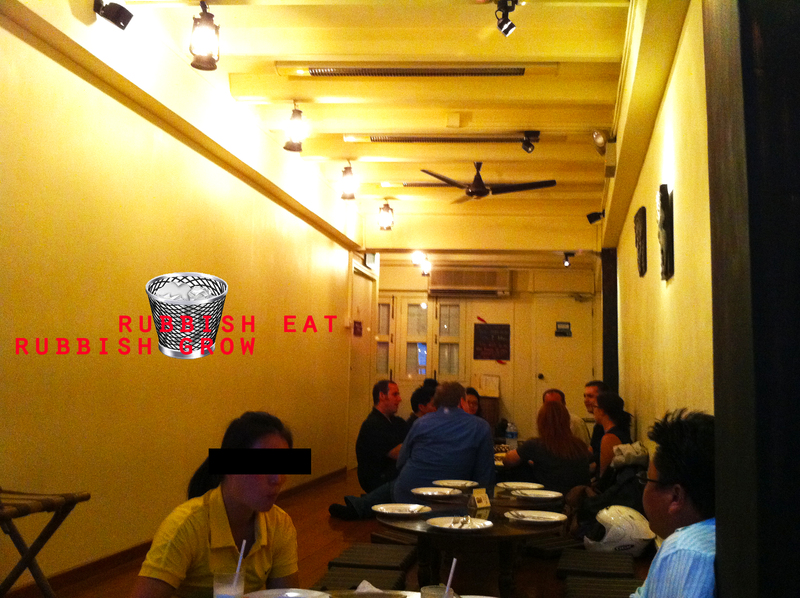 Note: Full house on a Monday night, best to make reservations.